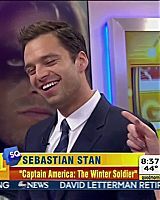 Going into Captain America: The First Avenger, I have to imagine you were hoping to get a chance to play Winter Soldier. Were they ever discussing plans for that during the first movie, or did they come to you with the story much later? 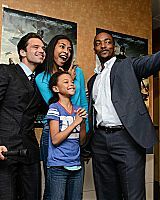 Sebastian Stan: The whole story was brought to me before we shot the first movie. I didn’t really know where they were going to take the sequel next, or even if we were going to have a sequel, at the time. We were still making the movie, which is why when people start talking about the next film now, it’s the same thing. The movie has to come out, so I didn’t really know, at all. In the script, there were certain things about Bucky Barnes, he wasn’t written linear. There were peaks and valleys and some dark undertones, and that kind of made me feel like this is a chance to show various colors of things, depending on how it’s going to go. I read you really embraced the training aspects of this, especially with the knives. Even before I saw the movie, that knife fight part in the trailer was one of the coolest things I had seen in awhile. Sebastian Stan: Yeah, you’ve got to credit our stunt guys. I had this amazing stuntman, James Young, and he was teaching me everything, in terms of the knife training. Yeah, we got into it, because we had the time and we really wanted to get it. It was fun. I mean, Chris (Evans) had been in a number of action movies, but I don’t think any of us had learned this type of sequenced, choreographed type of fighting. This was something that, if there was a shot that would take three minutes, we would break it up and it took awhile. We took advantage of trying to do as much as we could. The Winter Soldier’s look is so menacing and awesome, and you know right away this guy is bad. It was like one of those Darth Vader moments, where you see this guy and you know he’s the real deal. Can you talk about the actual costume you had to wear and the arm. Was there a lot of bulk to it, or were you still able to move around in it rather well? 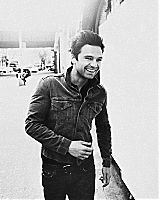 Sebastian Stan: There was a lot of bulk to it. The way that the costume came together is it was made from five different pieces, and flexibility was definitely an issues, one we couldn’t have really known, because we weren’t rehearsing with the costumes on. We just saw how flexible we were once we got on set. It was tough. We went through some periods where we ripped a bunch of the costumes, just flying by the seat of your pants, a little bit. The arm was very specific. There were a couple of them, some more mobile than others. The ones that were more immobile were actually the better looking ones that looked cooler, so I always wanted to have that one. By the end, we just really adjusted to that. 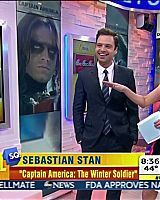 Sebastian was on Good Morning America this morning to promote Captain America: The Winter Soldier, which is in theaters now! You can watch his interview below, as well as view captures in the gallery! A very big thank you to my friend Pedro of ChrisEvansHQ.com for the video! Sebastian Talks Injuries, That Hair & His Action Figure with TooFab! TooFab.com — Bucky Barnes has gone to the dark side! Sebastian Stan returns as Captain America’s BFF in “Captain America: The Winter Soldier,” but he’s got a whole new look and one baaaaad personality. 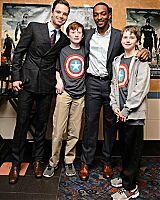 Though he was presumed dead after the events in “The First Avenger,” Barnes reappears in the present day as a ruthless, brainwashed assassin with a bionic arm. 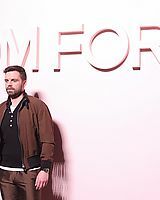 toofab’s Brian Particelli sat down with Stan before the film’s US premiere, where they talked about his return to the Marvel Cinematic Universe, picking up the fast-paced fight choreography, and, most importantly, who had the best hair flip on set. “Listen, in that department I think Black Widow’s got everybody beat,” Stan says with a laugh. It’s true, he looks like a totally different person in this movie — sporting a costume straight out of the Marvel comics. Entertainment Weekly Photo Session and High Quality Scans Added! 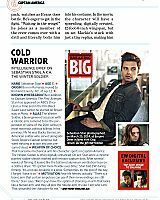 I’ve added high quality scans from Entertainment Weekly as well as their gorgeous new photoshoot with Sebastian! Thanks to my friend Claudia for the scans! ORIGIN Born in Romania, moved to Rockland County, N.Y., at age 12. KNOWN WHEREABOUTS In addition to Captain America: The First Avenger, Stan has appeared on ABC’s Once Upon a Time and in the film Black Swan. Last winter he starred on Broadway in Picnic. ALIAS The Winter Soldier, a bioengineered assassin with a robotic arm, rumored to be the perpetrator of some of the 20th century’s most notorious political killings. 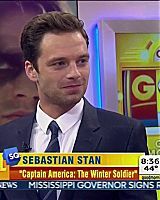 In his previous life he was Bucky Barnes, an American -soldier who served alongside Steve Rogers/Captain America, but went missing in action and was presumed dead. Check out Sebastian’s interview in full over at TheWrap.com! Marvel Studios is known for its secrecy — both among fans, and the stars of the movies themselves. Take Sebastian Stan, for instance. 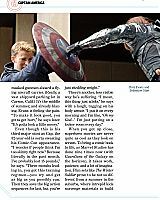 He landed the crucial role of Bucky Barnes, the best friend of Steve Rogers, in 2011’s first “Captain America” film. 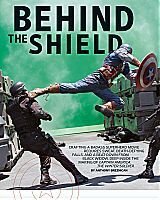 The movie ended with Bucky presumed dead, but with the actor signed to a nine-picture deal and the comics providing plenty of roadmaps for the character’s future, it was pretty obvious to everyone that his fall in “The First Avenger” would not be the last we heard from Stan or his character. Common wisdom aside, however, no one knew exactly how Barnes would return — include Stan himself. 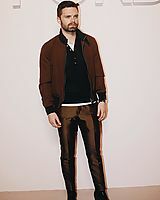 “I knew about the storyline of the character, and kind of what happens in the comic books; they educated me on the character when we started discussing him, but everything was sort of ‘Knock on wood, if things go well, we’ll see how it goes,’” Stan told TheWrap, referring to the uncertainty surrounding the future of his big screen alter-ego. 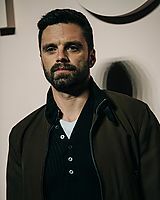 As it turns out, the actor found out that Barnes would come back as the villainous Winter Soldier — an amnesiac Soviet assassin — “about two years after we shot the first film,” he said. So Stan did some recon work himself, working off clues he found both in the comics and in the initial script for the first film. 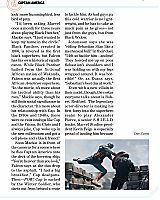 He also did his best not to worry about how the other Marvel films would or could impact his own — even if it boasted crossover stars like Scarlett Johansson (Black Widow), Samuel L. Jackson (Nick Fury) and Cobie Smulders (Maria Hill). He was just excited to be working with them, he said, and got himself ready to go when the call came. “When you have a lineage of books to turn to, you can kind of find cool character stuff that you hope to kind of bring into the movie if there’s an opportunity,” Stan said. 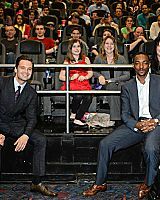 Also helpful: Talking with the person that created the character of The Winter Soldier in the first place.